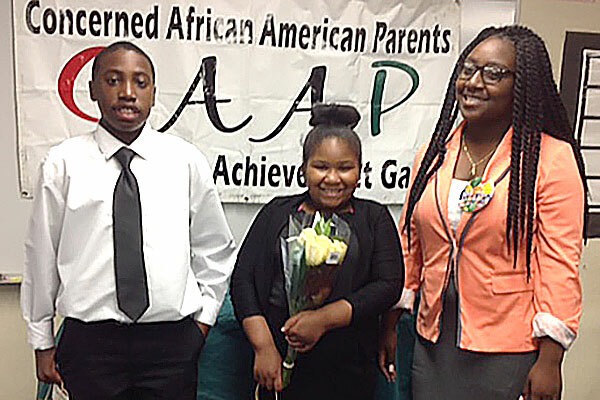 Students from Holmes, Nelson and McBride schools each won first place in the annual Oration Contest held by the Long Beach Unified School District’s Concerned African American Parents group. The winners in their grade-span categories were fourth grader Brooklyn Morris of Holmes Elementary School, eighth grader Caleb Jackson of Nelson Middle School, and eleventh grader Ajahanae Favors of McBride High School. The students researched the contributions of James Weldon Johnson, writer of the Black National Anthem, “Lift Every Voice and Sing.” Students also shared how they would use their talents to uplift and make positive changes in their community. Each winner received a $100 gift card. CHAMPIONS - Students Caleb Jackson, Brooklyn Morris and Ajahanae Favors each won first place in the recent Oration Contest held by LBUSD's Concerned African American Parents group.